The other day I was going back through my book trying to identify the loose ends and cut out unnecessary stuff. I was reading a part in which the MC was going for a ride on her horse. Her horse is a very important part of her life, so I got very descriptive when I wrote that section, because I wanted the reader to really feel the joy she gets when she’s riding him. Also, I love to ride, so I was indulging myself somewhat, as I was bringing up all the sights, sounds, and smells that come with it. As I was reading, I got really sucked in. I felt like I was there in the field, like I was the one taking that ride in the misty summer evening, rather than sitting in my living room on a chilly November night, and it was wonderful. When I closed the document for the night and headed up to bed, I started thinking about the power of words. I thought of the way the words in my book made me feel, and how certain books can pull you into their world so completely that when you close the book you feel like you’re waking up from a dream. As wonderful as photographs are, I haven’t found any that have that power. There are some beautiful photographs and paintings that make me feel something, it’s true, and photographs can capture those moments with my family that I want to keep in my visual memory, but words have a transporting power for me that images just don’t. Even movies lack that extra quality that brings the magic to life. I decided to use the photo above to illustrate my point. 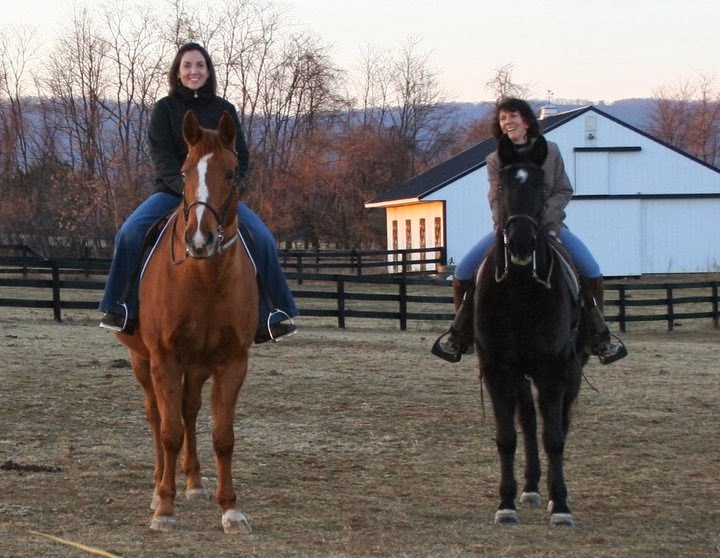 This is my mom and me riding at her house- she’s on her horse Diamond (who passed away this year, sweet horse), and I'm on my sister’s horse, Chase. From the photo you can see that it’s cold- we’re wearing coats- and that the sun is probably setting from the orangey light reflecting off the barn in the background. Obviously we’re happy as well. Those are just a few things that I saw and felt that evening, things which, for me, make that memory come alive. And that’s why reading and writing are so important to me: I can be transported and even transformed. I can immerse myself in another time, another place, even another person, and experience wonderful and remarkable things. It’s not just about a plot and a story- it’s about the art, the tactile feelings. It’s about an author and a reader taking a journey together. And since tomorrow is Christmas Eve, here’s my little Christmas card to all of you MMWs out there- this is a fun song that just gets me all excited for Christmas! Merry Christmas, everyone! I love this!! I would never have thought about everything I was missing in a picture like that. Well said. This is a great song! Never heard it before. Thank you!